More power, with a grand touring vibe. 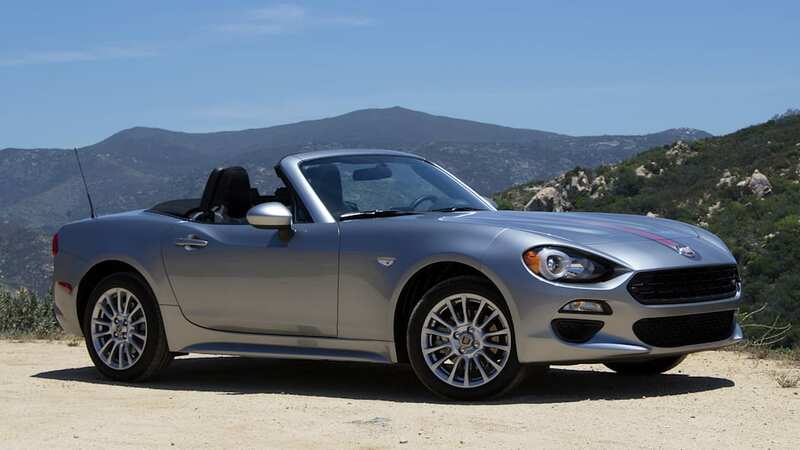 If you've been following the protracted birth of this car, you probably know the basics: The 2017 Fiat 124 Spider is a Mazda MX-5 in an Italian-designed suit. It's built in Japan, and it was engineered by Mazda but sports a Fiat engine – shared bones, different philosophies. 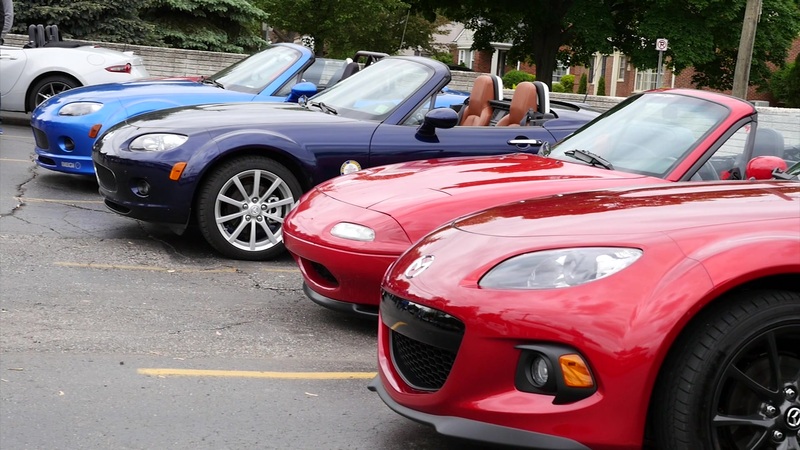 A quick Miata aside: When we found out the latest MX-5 had less power than the NC-generation car that came before it, what got shouted down was the fact that it's significantly lighter, and it's also a damn riot to drive. It doesn't need more power, and we reaffirm this belief every time we get in one. I did just that, driving one to the airport to catch a flight to San Diego this week. With the MX-5's charms freshly in mind, I drove the 124 Spider in both basic Classica and posh Lusso trims on-road, ­and briefly sampled the sportier Abarth version at a long autocross-style cone course. 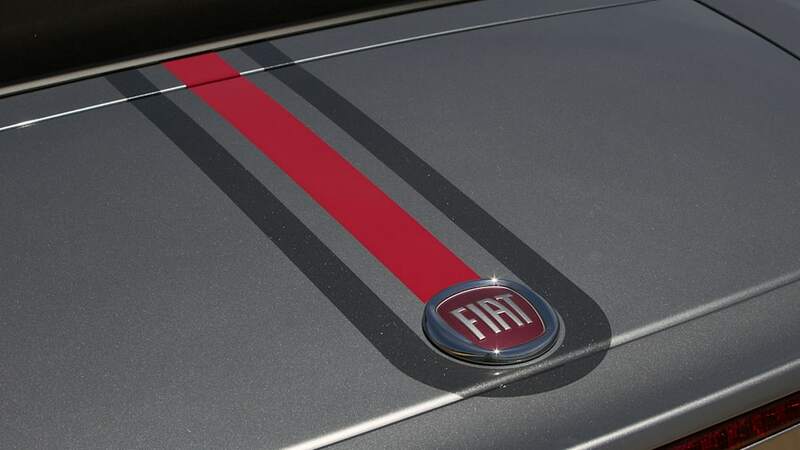 What I really wanted to know is how much Fiat character found its way into the latest evolution of the Japanese interpretation of the classic European roadster. Whereas the MX-5 is stretched drum-tight over its hardpoints, the 124 Spider has an extended nose and tail; since the wheelbase is unchanged, this manifests in larger overhangs. 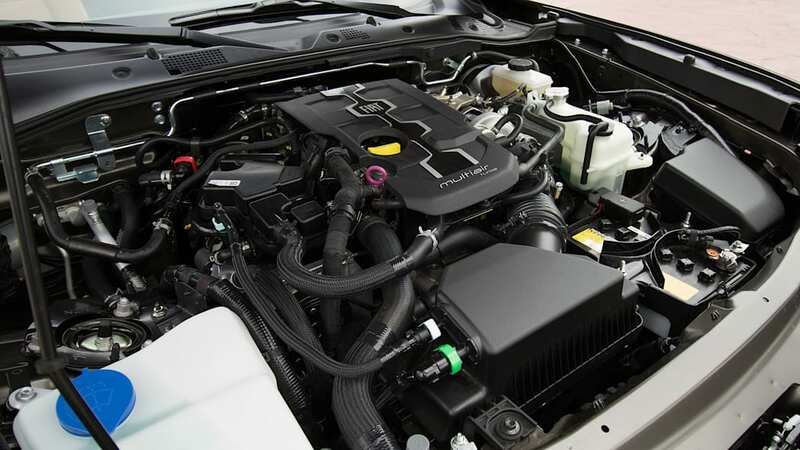 To be generous, this body stretch increases the trunk space slightly and improves cooling to the turbocharged engine, which faces more significant heat-management challenges than Mazda's 2.0-liter. It also gave Fiat's designers some room to incorporate scallops for the LED-equipped headlights that recall the sealed beams on the original Fiat 124 Spider from 1966, those iconic twin power bulges on the hood, and an angular grille. Whether you consider the 124 to be attractive on its own, in comparison to the MX-5, or an appropriate homage to the original car is entirely subjective, but I'll weigh in with mixed feelings. Sharing a platform has its challenges, and recall that Fiat came into this development process late. This was supposed to be an Alfa Romeo, remember? 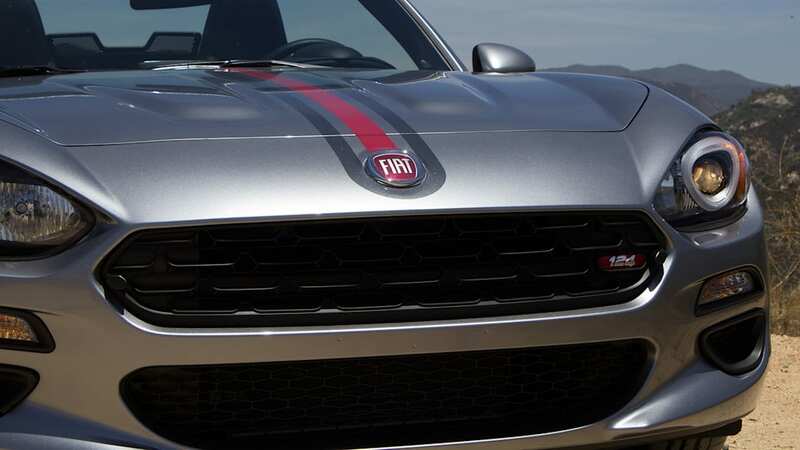 How that affected the design process isn't clear, and no one would cop to it, but it seems that the Fiat-ization of the MX-5 didn't happen at a leisurely pace, nor on Fiat's terms. I think it's less handsome than the MX-5 in general, but in certain colors (and in the Abarth trim) it's a looker. 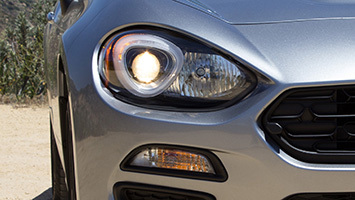 The front end is especially handsome, and the character line that kicks up at the door handle adds some real interest to the profile. The homely squared-off taillights are a disappointment compared to the MX-5's quasi-Jaguar units, but the power bulges on the hood are delightful. 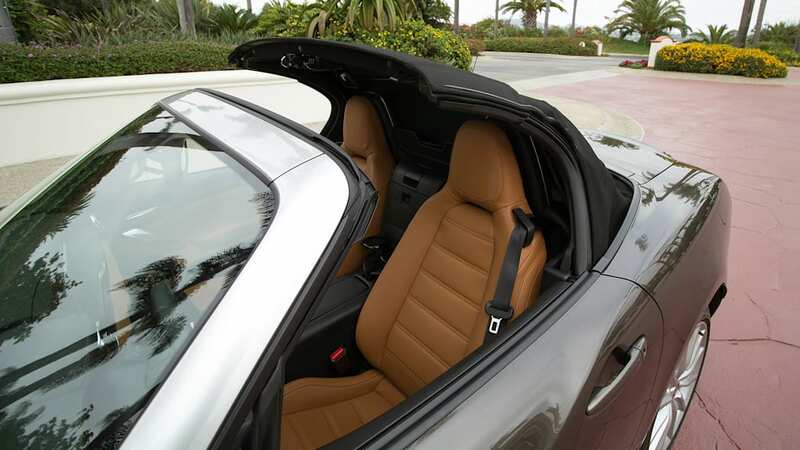 Softtop operation is just like the MX-5's: it's a simple operation accomplished easily from the driver's seat. See our demonstration below. 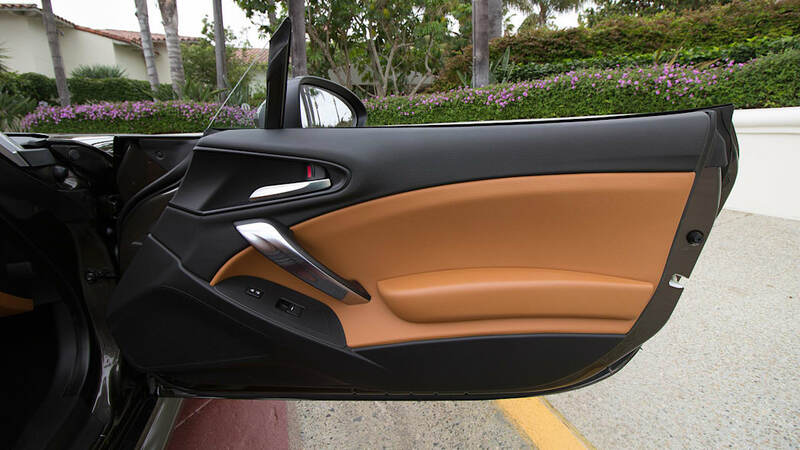 I was disappointed to discover that the interior went in for only the most minor of revamps. 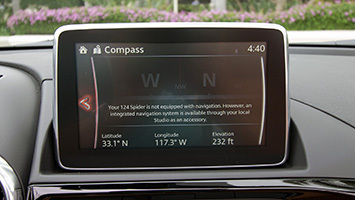 Mazda's Connect infotainment system carries over, as do the gauges (although the Abarth has a red applique surrounding the central tach). The Mazda wheel wears a Fiat badge and a different rim, and the seats use the structure from the Miata's with Fiat coverings and altered stuffing. 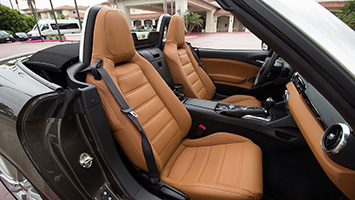 This is admittedly a non-issue if you're unfamiliar with how Mazda's interior bits look, and it all works just as well as it does in the MX-5. 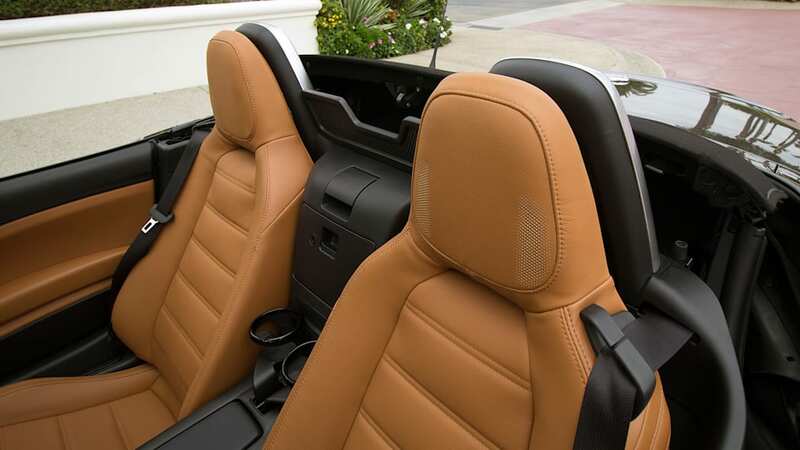 I think the Lusso's tan leather seats, with handsome stitching, look great. The biggest change is under the hood. 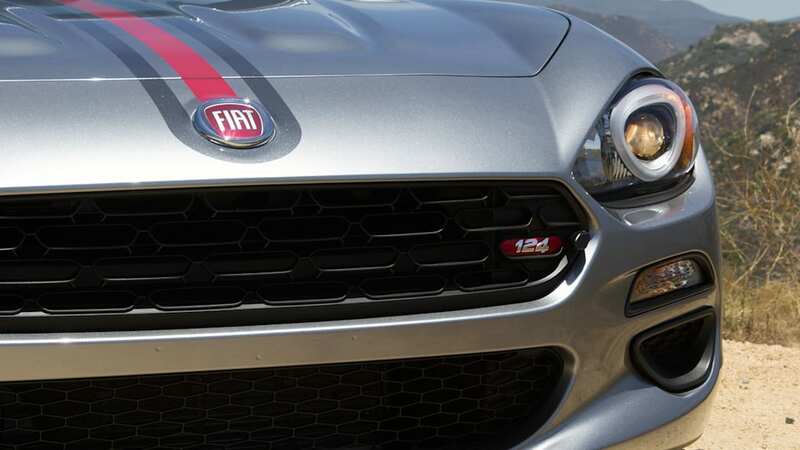 The 124 Spider's engine is a version of the 1.4-liter, turbocharged inline-four from the Fiat 500 Abarth, fitted with clever MultiAir variable valve control technology. 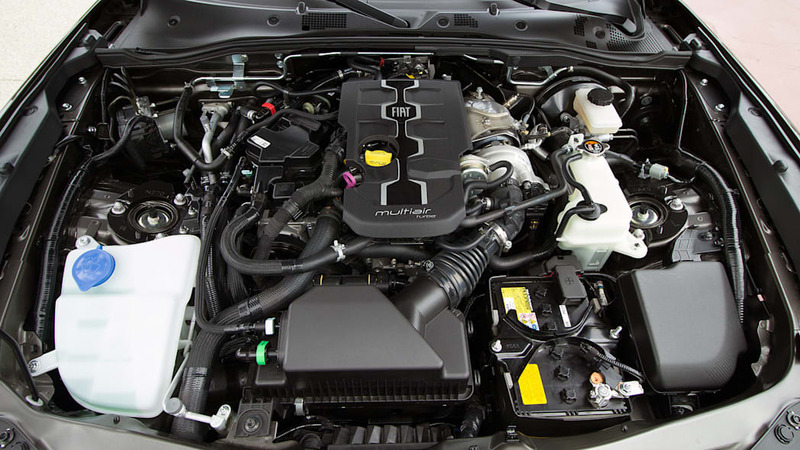 In that rambunctious little hatch, it sits transversely, but the 124's engine is modified to fit north-south in the engine bay and makes 160 horsepower at 5,500 rpm and 184 lb-ft of torque at 2,500 rpm. 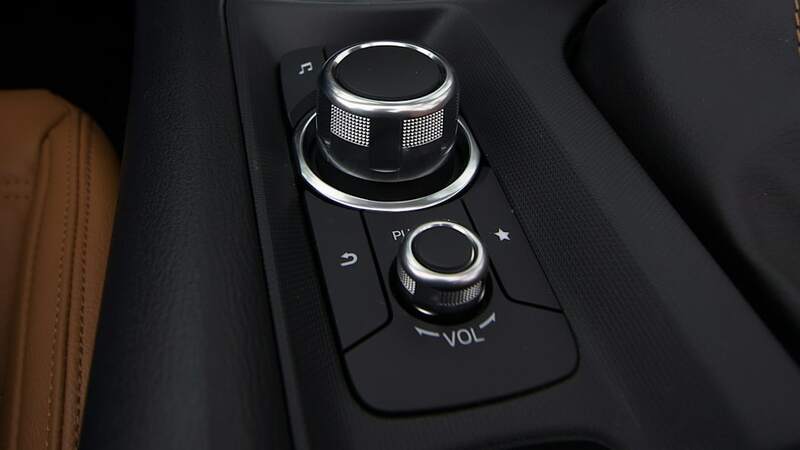 It's a torque-rich, lower-revving unit with a 6,500 rpm redline. 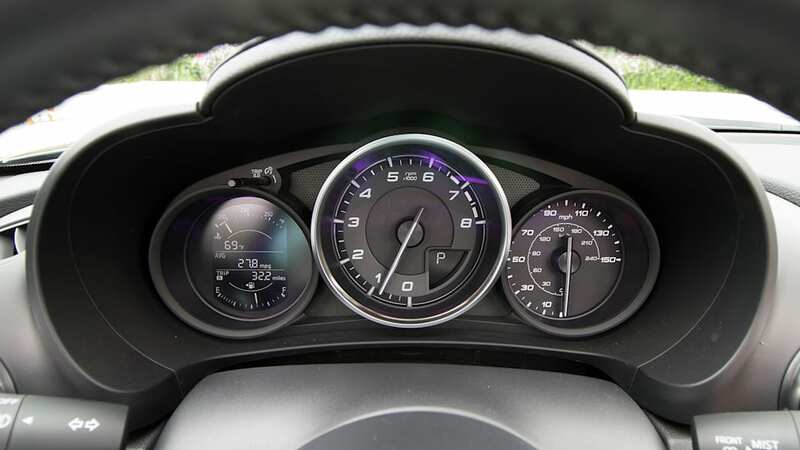 By comparison, the MX-5 makes 155 hp at 6,000 rpm and 148 lb-ft at 4,600 rpm, with a slightly higher redline. But the 124 Spider's engine is most notable for its lack of aural drama. Yes, turbocharged engines tend to have muted exhaust notes, but the 500 Abarth this engine is yanked from is famous for its raucous soundtrack. 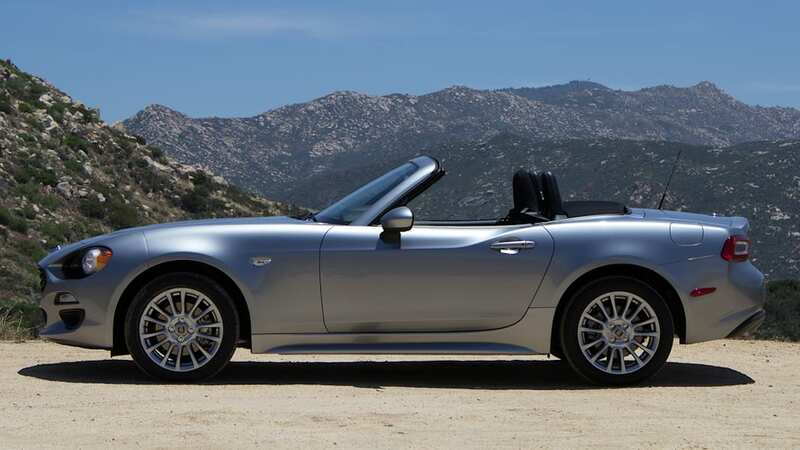 The Fiat 124 Spider simply doesn't sound as enjoyable as the MX-5, which achieves a perceptible and wonderfully tuned note that doesn't drone or intrude. Fiat reserves some melodrama for the Abarth version with its quad-tipped sport exhaust, and a Mopar accessory exhaust takes it one step further. 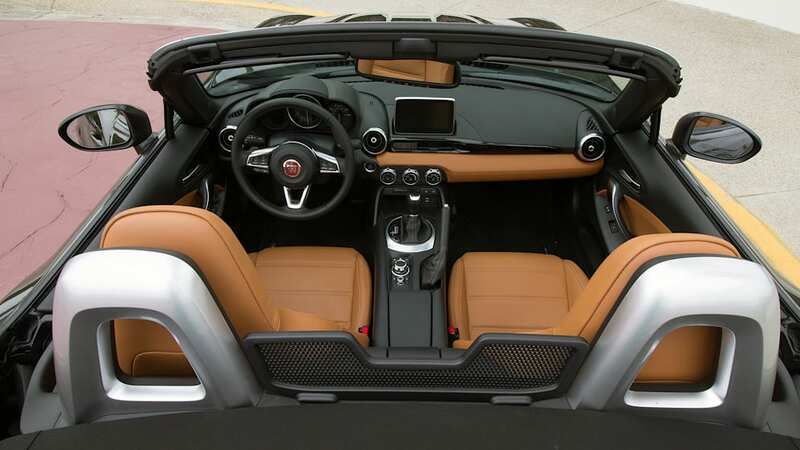 Some of the quietness is due to additional sound insulation, including a laminated windshield and extra material in the soft-top – but with the top down, the Fiat's generic, slightly growly exhaust note is hushed. One other mechanical difference worth noting is the transmission. 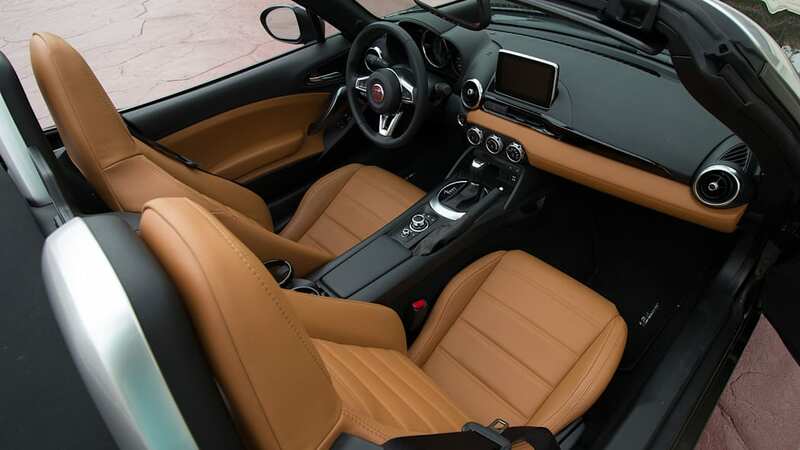 The 124 Spider uses the last-generation Miata's six-speed manual, as its better suited to the torque output of the 1.4-liter Fiat engine. That adds a few pounds to the car, and it's not quite as snickety as the ND MX-5's buttery shifter. 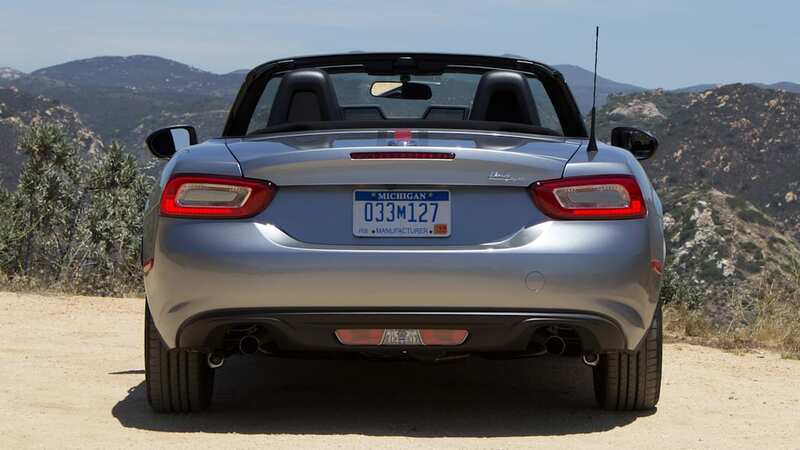 Overall, the lightest 124 Spider weighs 2,436 lbs to the lightest MX-5's 2,332 lbs. 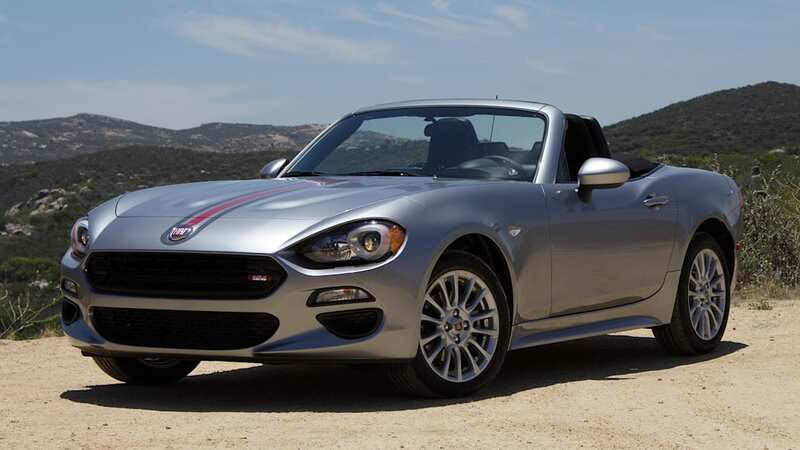 The Abarth automatic is the heaviest 124 Spider, at 2,516 lbs. Despite the additional poundage, weight distribution is the same as the MX-5 (without a driver) at 54 percent front, 46 percent rear – and with a driver, close to 50-50. 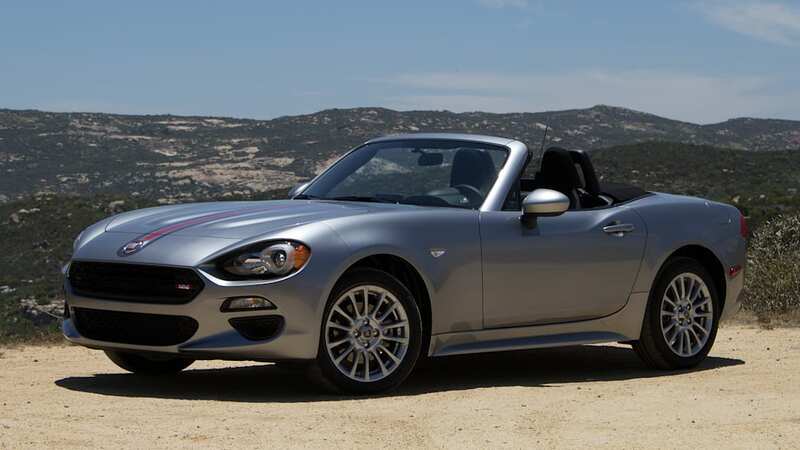 Fiat engineers had to retune the suspension to accommodate the 124 Spider's increased heft, but also weren't happy with the MX-5's propensity for body roll, so they fiddled some more to flatten things out. The other hardware – control arms, bushings, and so forth – is unaltered. The result isn't as compromised as it sounds, and some of the changes are positive. 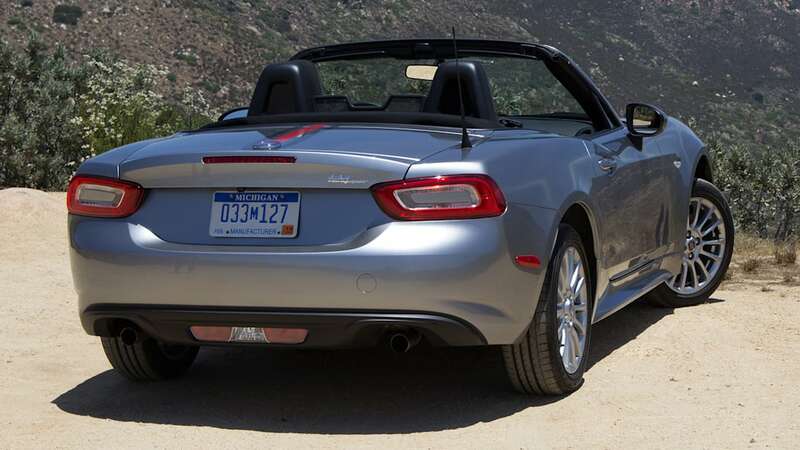 The 124 Spider doesn't crash as much over imperfections as the MX-5, and does corner more flatly. On the tight, windy sections up in the hills, the Classica's milquetoast tires were the main damper on fun. 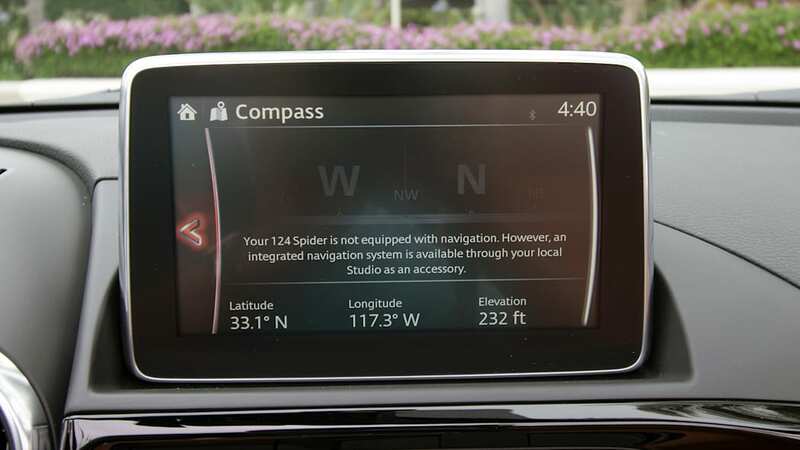 It'd take a skidpad to determine the Spider's handling handicap, but considered in isolation the 124 Spider displays excellent balance: dial in some steering and make further adjustments with your right foot. There's plenty of warning before you exceed the adhesion limits – overcook it and it's at least as forgiving as the MX-5, if not more so. 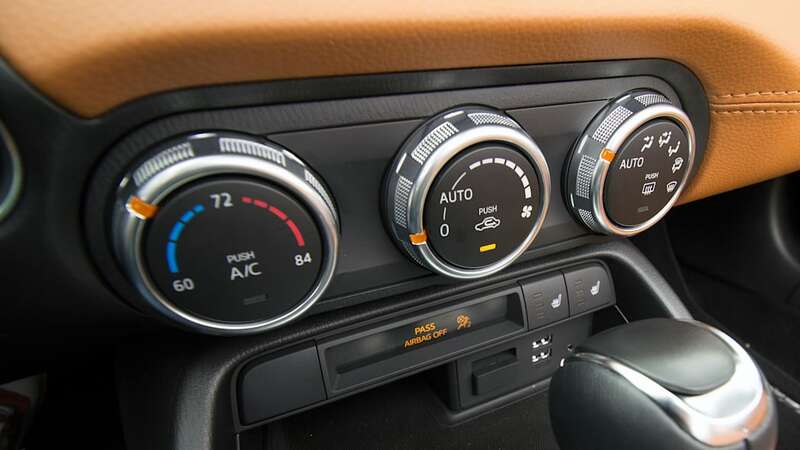 Go ahead and turn the traction control off; you're unlikely to get into trouble. 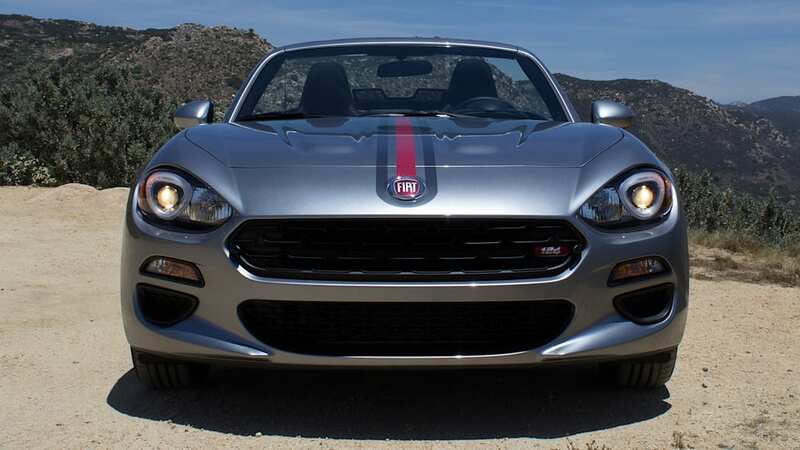 The Abarth, with stickier tires, Bilstein dampers, and exclusive limited slip differential adheres more but has the same mild-mannered breakaway characteristics. 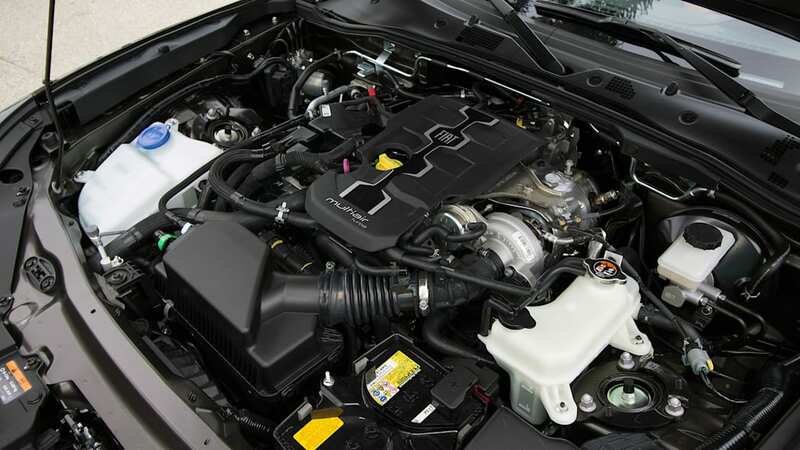 The other useful 124 Spider characteristic is the broad swell of torque in the midrange. When the turbocharger starts to puff heavily, there's enough grunt to power out of an understeery wallow. On windy public roads without a stopwatch in sight, the real fun was using brute force to churn out of one corner and truck over to the next. The extra muscle also made gear selection less important. Braking is excellent, progressive, and suited to the car; from what we experienced at the autocross, the optional $1,495 Brembos on the Abarth version are more aggressive. 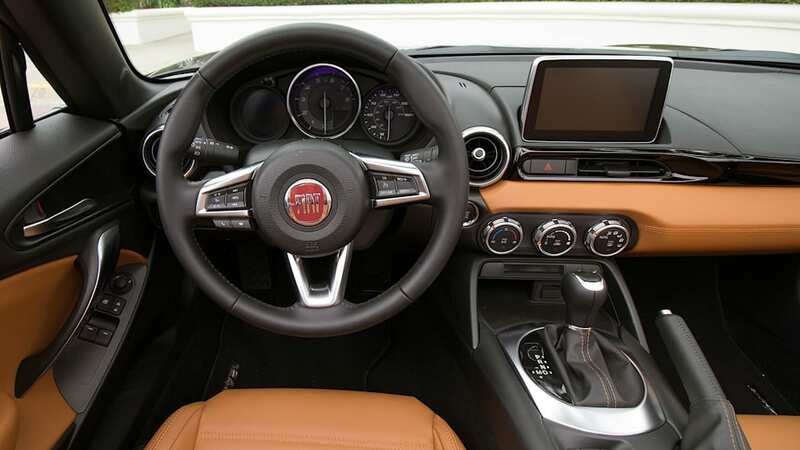 The MX-5's steering is notable in its lack of self-centering, and the Fiat's electric power steering tuning fixes that and also adds a meatier feel while remaining light at low speeds. As for the Abarth, I'm hungry for more time behind the wheel to see how that upgraded suspension does on the street, and how it compares to the MX-5. Even though the Abarth doesn't bring that much more additional power to the table, deriving its 4-hp increase entirely from the Abarth-specific exhaust, the underlying 124 Spider is no slouch. 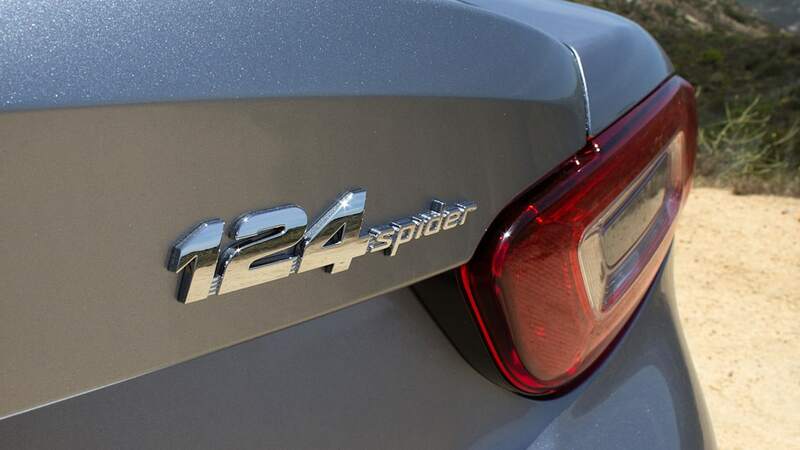 Whatever flavor of 124 Spider appeals to you, they're all reasonably priced. The basic Classica starts at $25,990, the Lusso at $28,490, the Abarth at $29,190, and the Prima Edizione is much less of a deal at $35,995, but what price exclusivity? 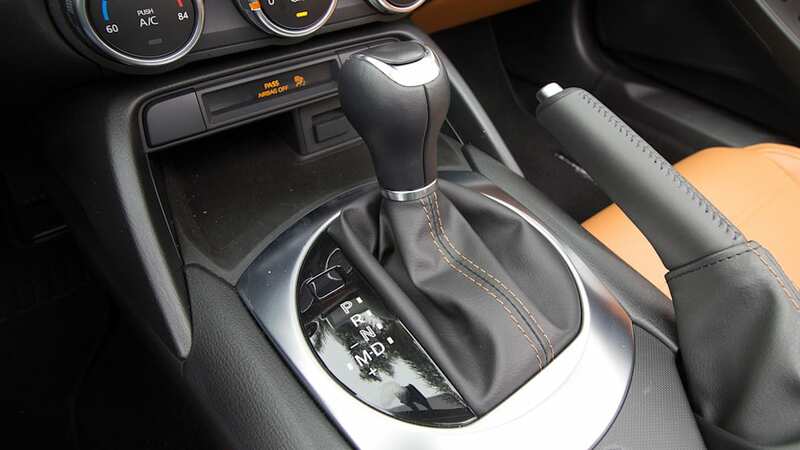 A six-speed auto is available on all trims as a $1,350 option; we drove a Lusso with the auto, and while it's a bit slow-witted when called upon to drop a couple gears, it's pleasant enough in all other situations. The 124 Spider is fundamentally a mature, grown-up MX-5 that rides more smoothly and has easily accessible but moderate levels of power. The exhaust doesn't drone, and with the top up, it's much quieter than the MX-5 – both of these qualities help fight fatigue from long hours on the road. 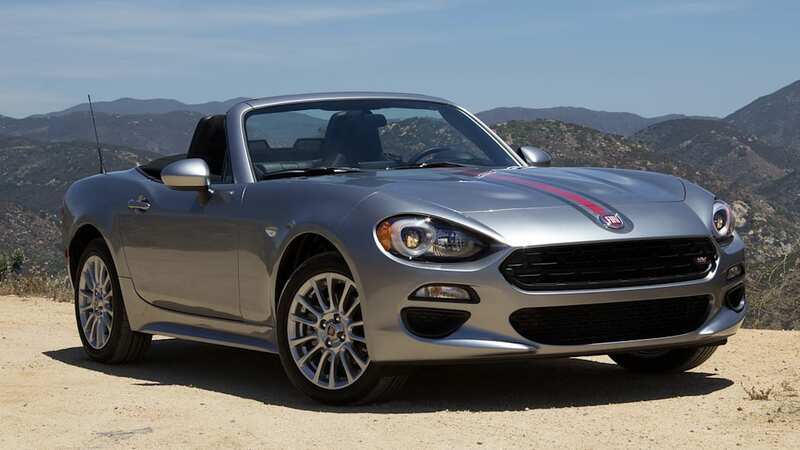 Pair that with the smoother suspension and the Fiat 124 Spider brings some comfort and sophistication to the parts of the trip in between the tight corners. If you'd like to be inconsiderate, call the 124 Spider a boulevardier, although it'll comport itself just fine in the hills. Instead, I'd invite you to think of it as the grand touring version of an excellent sportscar. If I wanted to take a trans-continental roadtrip, I'd happily ride off in a manual-transmission 124 Spider, hit a few fun corners on the way, and climb out at the end of each day a little less exhausted. 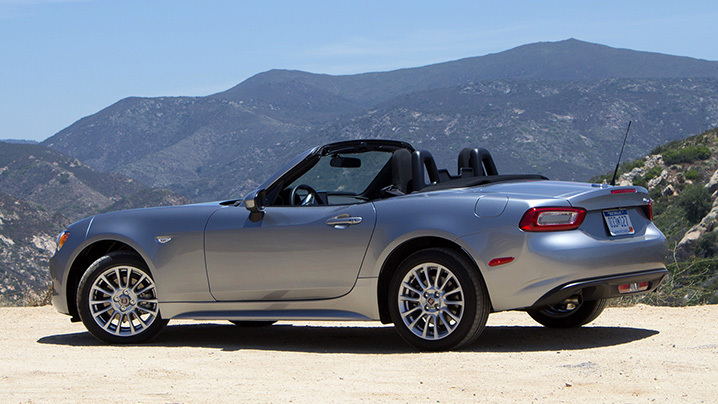 If it's an afternoon in the canyons or a day at the track, give me an MX-5. Whether the 124 Spider appeals to you will depend on what you value, so choose your own adventure.